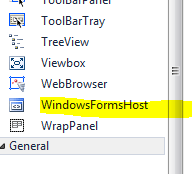 Windows Forms can be hosted inside a WPF application using WindowsFormHost. In this post I will show how easily you can use WindowsFormHost to host a windows Form content inside a WPF application. Create a Windows control library application. Lets put something really simple in it. I have put one Button and one Textbox. When the button is clicked I have put a MessageBox to show the textbox message. Add a WPF application to the Solution and Add reference to the Windows Forms Control library project to it. Now drag a WindowsFormHost from the Toolbox to the WPF Grid container. The necessary dlls will be added automatically. Note : We name the WindowsFormHost control as wfh. 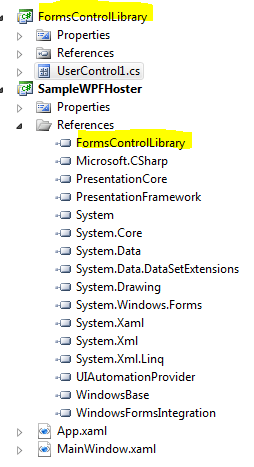 Now if you run the application, you will see the Windows Form control is shown inside the WPF content. Remember, WindowsFormHost has an associated HWND associated with it. Hence it has Airspace issue associated with it. That means it will always rendered above WPF elements (except Popup) and cannot share pixels with WPF content. If you make the UserControl transparent, it will paint the background with the parent control and hence can look like a hack to it.